On Thursday the Royal Liverpool Philharmonic were joined by the latest in a run of outstanding soloists that Phil audiences been treated to in recent weeks. Chinese pianist Niu Niu may be only 19, but he’s already an experienced concert performer and recording artist and his 2013 EMI album of Liszt transcriptions was recorded in the RLPO’s studio, The Friary in West Everton, so he’s no stranger to Liverpool. 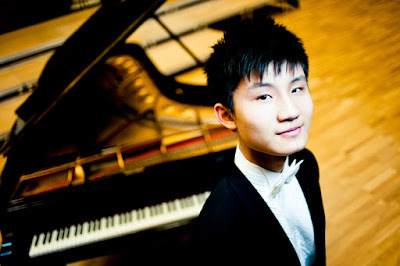 Rachmaninov’s Rhapsody on a Theme of Paganini was a great choice of work for Niu Niu to debut with the orchestra, its variations enabling him to demonstrate a wide range of colour and texture, from dramatic weight to delicate fluid playing. The prolific Polish conductor Jacek Kaspszyk, making a welcome return to Liverpool, opened the concert with the rarely heard Concert Overture from his countryman Karol Szymanowski. An early work, the overture feels as though it owes much to Richard Strauss in the opulent scoring and shifts in dramatic energy. A substantial piece for large orchestra, we are left wondering why this doesn’t feature more often in concert programmes. A similar question might be asked of the work that occupied the second half of the concert, and the extravagant orchestration probably serves partly as an answer in both cases. Schoenberg’s orchestration of the Brahms Piano Quartet in G minor turns a relatively unloved chamber work into what is effectively a symphony. Another early composition, both for Brahms and for Schoenberg, it begins feeling very much like the symphonies of Schumann, flirting with Mendelssohn in its intermezzo movement before finally finding the world of Brahms’ Hungarian Dances in its exuberant “Rondo alla Zingarese” finale. For this work, Kaspszyk placed the French horns to the far left of the stage behind the back desks of first violins, which created an unusual but intriguing spread of sound. Sadly, the appearance of names like Szymanowsky and Schoenberg on a concert programme often frightens audiences off at the box office, and there were quite a few empty seats in the hall. This is a shame, as these two less familiar framing works to Rachmaninov’s perennial crowd-pleaser were hugely well received and, above all, the whole concert felt like enormous fun for audience and performers alike. Appropriate for the concert to end on an exuberant note, as it also marked the final appearance of first violinist David Whitehead, who is retiring after 32 years’ service with the orchestra.